The new Cheetah uniforms can be sized and signed out beginning this Thursday (April 21st) and continuing through the weeks of April 25th and May 2nd. Please read the following carefully so you know what night is scheduled for your athlete. 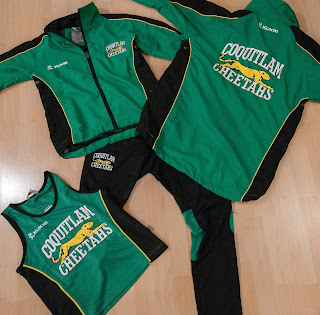 All Junior Development athletes will have the opportunity to sign out uniforms before the first event of the season – the Norwesters Elementaries meet May 7th and 8th. As every athlete will get a new uniform this year, multiple evenings will be scheduled, differentiated by year of birth. Returning athletes (who are also required to return their current uniforms) will be scheduled separately from new athletes (who only need to sign out new uniforms). The full schedule will be posted at the end of this week, and will include further exchanges for returning athletes through the week of April 25th and pick-ups for new athletes through the week of May 2nd. There will be numerous opportunities for exchange and pick-up with flexibility for multi-child families and for training start/end times. Should the scheduled dates and times not align with availability, contact Lauren to make alternate arrangements. Uniform sign-out requires a previous or new $100 deposit (cheque or cash) per athlete, refundable upon returning the uniform. Returning athletes are required to return their current uniform in order to sign out a new uniform. Exchanges and pick-ups will occur in the equipment shed, located near the high jump and javelin area.